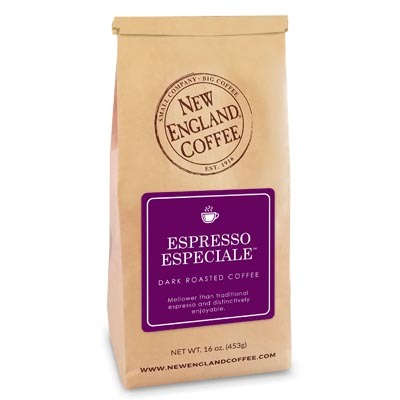 Smooth, luscious vanilla in a mellow blend of medium-roasted South and Central American decaffeinated beans. For a refreshing alternative, escape the daily grind with your favorite New England Coffee – iced! Make a splash and enjoy your next cup of French Vanilla Decaf coffee – iced! As a rule, decaffeinated coffee is disgusting. Thank you for making this DELICIOUS decaf! I love the decaffeinated french vanilla! Please add the single servings (k-cups). I have tried to find decaf French vanilla in every store and internet since my local wal-mart stopped having it. I am so happy to have recived my first bag,? it!. I am know searching for decaf hazelnut French vanilla mix. Can’t wait to try more of your other flavors. Thanks so much ??. Love the French Vanilla Decaf, can’t find it in stores anymore. Glad that I can order it on line. Can only drink decaf and New England French Vanilla is the best!!! The single best French Vanilla including caffeinated I have EVER tasted! Best is whole bean – just luscious every time! Sometimes I mix in some Chocolate Cappuccino beans as well–a little vanilla/mocha flavor that’s amazing! I was visiting family in New England and tried New England coffee and instantly fell in love. Now my doctor told me to switch to decaf coffee. 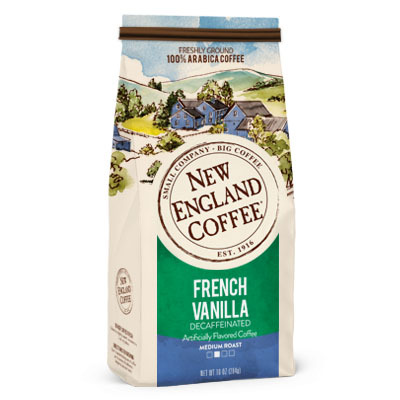 New England Decaf French Vanilla coffee is the very best I’ve tried anywhere. Flavored decaf coffees are impossible to find. I buy the whole bean coffee which is amazing! I enjoy it hot and iced. Delicious! I’m waiting for you to make more decaf flavors. My Grocery store said this was discontinued! Was happy to see this on the company website. This is my favorite coffee for years! Its always the first to run out in my grocery store as long as I remember. Not sure why they would discontinue it. Originally found this flavor on a store shelf but then it was discontinued by the vendor. At the time, I was not able to consume caffeine and so this coffee was just the right brew for me. So good to find it online! Now I continue to drink it for the flavor regardless of caffeine level now that I am able to tolerate caffeine. one of the best coffees. their decaffeinated coffees are very very good. I recommend to anyone who has to drink decaffeinated coffee.